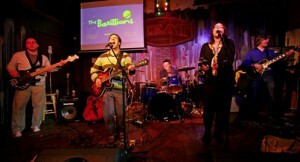 Bring the live performance of THE BAZILLIONS to your next event, party, festival, or whatever you’re planning! 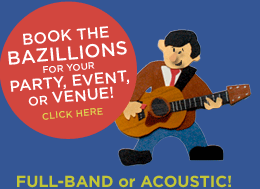 The Bazillions’ live show can be scaled to almost any venue, from a solo acoustic performance from lead singer Adam Marshall, or an acoustic trio or four-piece, or the full five-piece electric band. We love to play libraries, schools, auditoriums, outdoor festivals, and private parties — just to name a few. 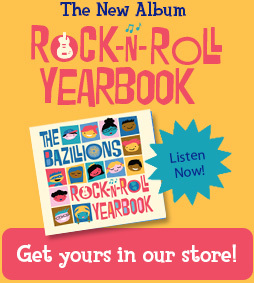 The Bazillions’ music is an instant hit with kids and their families, and a live performance is an experience fans young and old will surely enjoy. 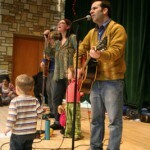 Kids can sing, dance, run around and rock out with the band! 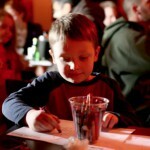 Along with live music, The Bazillions performances can be expanded to include projected animated video to accompany the music, and crayons and coloring sheets for creating fan artwork during the show. We will bring a camera to photograph any fan artwork if the artist would like to see their work on The Bazillions’ web site.